Bethesda native Julie Kent returns from New York to take over as Artistic Director of The Washington Ballet. WASHINGTON — She donned a sneaky disguise so that the Kennedy Center audience wouldn’t freak out, knowing a ballet legend was sitting in its midst. 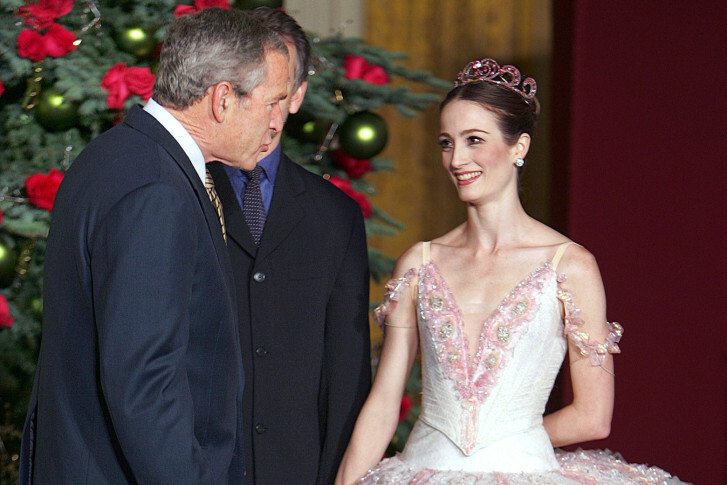 It was the best way for Julie Kent — a Bethesda native and acclaimed principal dancer at New York’s American Ballet Theatre (1993 -2015) — to see if she wanted to take over the Washington Ballet. “Ballerinas are very recognizable, especially ones with very long hair such as mine. … I wore one of my favorite hats and I invested in a pair of glasses without prescription lenses, and I have determined that nobody is interested at all in someone wearing a hat, glasses and putting their head down into the program. No one gave me a second look,” Kent tells WTOP, laughing about her covert visit. Liking what she saw at the “Director’s Cut” program, Kent agreed to become the ballet’s new Artistic Director, taking over the reins from longtime fixture Septime Webre, who’s stepping down in June. “In the audience, I saw a broad spectrum of every walk of life. I saw grandmothers, I saw children, I saw fathers bringing their daughters, I saw mothers bringing their sons of different age groups. … All kinds of diversity in the best ways, and everyone seemed to be invested in the performance and take pride in that it was their company, which is exactly what we want to build on,” Kent tells WTOP. The exciting new gig is a homecoming for Kent, who was born Julie Cox in 1969 at Bethesda Naval Hospital, now the Walter Reed National Military Medical Center. Her American father was transferred to work at the Bureau of Radiological Health in Rockville, while her mother was a dancer in New Zealand who joined the Maryland School of Ballet, now called the Maryland Youth Ballet. “My mother began adult classes and took me with her as a two-year-old, so I was an observer in the room. Many of those ladies are still in their beloved adult classes and they often say, ‘Julie, I’ve been watching you dance for 30 years,’ and I say, ‘I’ve been watching you dance for 30 years! '” she says. At age 16, she won first place in the regional finals of the 1985 National Society of Arts and Letters at the Kennedy Center. In 1986, she was the only American to win a medal at the Prix de Lausanne International Ballet Competition, then moved to New York City to join the American Ballet Theatre. It was there that the great Mikhail Baryshnikov changed her name from Julie Cox to Julie Kent. “My father was the one that thought a more glamorous stage name might be what I should adopt … and I just said, ‘Dad, I think I’ll just stay with my name until things progress a bit more and maybe somebody suggests that.’ Fast-forward six months when Charles France, who was Baryshnikov’s assistant, came to me and said, ‘Ms. Kent, you’ll be dancing tonight.’ I started giggling,” she recalls. Working with Baryshnikov at ABT, she became one of the nation’s most respected ballet dancers at the world-renowned Metropolitan Opera House (The Met) on the Upper West Side of Manhattan. “Baryshnikov’s pursuit of excellence as an artist who changed the face of classical ballet in the 20th century was completely inspiring. It was incredible to watch him pursue excellence every day. He was very humble about his work, showed great respect for the art over the individual, and exemplified sophistication in a way I had never seen before,” Kent says. But it was a movie role that introduced her to future husband and fellow ABT titan Victor Barbee, who co-starred with her in the 1987 movie musical “Dancers” by Herbert Ross, who previously directed Woody Allen in “Play it Again, Sam” (1972), Richard Dreyfuss in “The Goodbye Girl” (1977), Anne Bancroft in “The Turning Point” (1977) and Kevin Bacon in “Footloose” (1984). “I got a call one morning when we were going to go to California to do a script reading before the movie started filming, and they said, ‘Do you mind terribly stopping off and picking up one of the young ladies that’s going to be in the film on your way to the airport?’ I said, ‘Sure, I’m just riding in the back of the limo. … We can ride around all day if you want,'” Barbee recalls. He’ll never forget the first time he saw his future bride approaching that limo. “This young woman came out of her apartment building and it was Julie. That was the first time we met. Fast-forward to now and we will have been married 20 years in September,” he says. Now, Barbee will serve as his wife’s Associate Artistic Director at The Washington Ballet. “She’s a perfect fit for Washington and for The Washington Ballet. Her professional experience and her taste and her artistic integrity have so much to bring to this institution that it was a no-brainer. … It’s a fantastic move for Julie and for the city and for Washington Ballet. We’re delighted,” he says. Yes, Kent is coming home to Washington, while maintaining her affection for New York City.